Custom Designed Complex Integrated Drive Systems – Often replacing & updating existing equipment. The SUBCOE EnerPACK systems and they will normally incorporate IEEE519 input filters, true sinewave output filters and power line transformers in a single enclosure package. They can also incorporate PLC’s for advanced system control and automation. 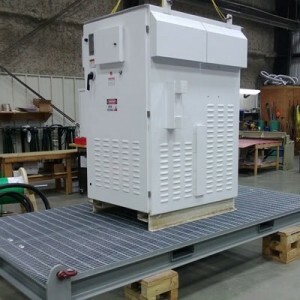 The highly integrated nature of our EnerDRIVE systems results in a more portable, easier to install & operate, smaller footprint power system which is very useful when there are space and local manpower limitations. The EnerPACK is a cohesive and functional system that is easier to install and maintain, these functional benefits are normally accompanied by a more competitive sales price as cabling costs, enclosure costs and major component integration costs are all minimized. Compounded with a significantly lower site installation cost the EnerPACK offers very significant cost benefits. We will generally recommend our EnerPACK packages when a more complex system is required to meet harmonic mitigation standards, where flexibility is needed to meet more exacting customer specifications or when a site is remote and difficult to access and support.